A new report from global management consulting, technology services and outsourcing company Accenture has found that enrollment in private health exchanges has doubled in 2015. The study found that 6 million people signed up for private healthcare exchanges this year, up 50 percent from 3 million people last year. The company surveyed 2,709 people in the U.S. between ages 18 and 64 in March. Accenture predicts that the growth in private healthcare exchanges will continue to grow, doubling to 12 million in 2016 and reaching 22 million in 2017. 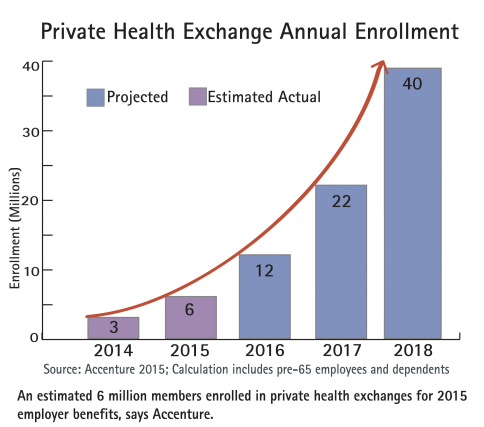 Accenture predicts enrollment in private healthcare exchanges to ultimately surpass federally-funded exchanges, with 40 million people enrolled by 2018. One factor driving the growth of private exchanges was a provision of the ACA that places taxes of 40 percent on “Cadillac” plans. Accenture estimates that 38 percent of large employers (defined as those with more than 2,500 employees) and 18 percent of business overall will face penalties come tax time. The firm forecasts that increasing regulations will drive large employers to adopt private healthcare insurance, especially new provisions of the Affordable Care Act (ACA), HIPPA and the Employee Retirement Income Security Act. Even with the ACA coming into effect and the growth of private exchanges, employers still chose to keep offering healthcare benefits. In fact, 76 percent of the people Accenture surveyed cited healthcare benefits as a primary reason they stayed in their current jobs. Accenture also forecasts more technology investment in private exchanges, citing Aetna’s acquisition of bswift and Mercer’s investment in Benefitfocus.